Elegant, sensitive, and a good performer, the Dufour 40e Performance won everyone over at first glance. She is an elegant yacht that can race as well as she cruises; excites as well as she entertains. When cruising there is no need for compromise! The Dufour 40e Performance has a functional, uncluttered cruising/racing deck layout, with the refinement of a recessed furling drum. 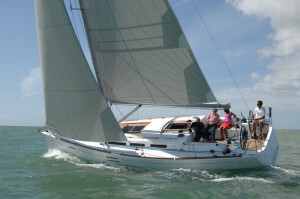 The Dufour 40e is suitable for sailing with a full or reduced crew, she is at home out on the open sea or sailing around the cans. She is the ideal mix of cruising and performance. The long, wide cockpit on the Dufour 40e Performance is well set up for cruising or racing; primary and mainsheet winches are within easy reach of the helmsman. With the optional German mainsheet system the traveller is also within easy reach, her cockpit layout is exceptional and aimed towards the ease of handling. Below decks the Dufour 40e Performance delivers the Dufour signature space and light. The saloon has linear post and starboard seating which doubles well as single berths without the need to convert the saloon table, although this is an option giving even greater flexibility.